1) I get a black screen for a couple of seconds during boot? 1.1) If you have an AMD or Nvidia GPU driving your screen, then this is normal. The graphics drivers for AMD and Nvidia GPUs reset the hardware when loading, this will cause the display to temporarily go black. There is nothing which can be done about this. 1b) If you have a somewhat older Intel GPU (your CPU is pre Skylake) then the i915 driver's support to skip the mode-reset is disabled by default (for now) to fix this add "i915.fastboot=1" to your kernel commandline. For more info on modifying the kernel cmdline, see question 6. .
1c) Do "ls /sys/firmware/efi/efivars" if you get a "No such file or directory" error then your system is booting in classic BIOS mode instead of UEFI mode, to fix this you need to re-install and boot the livecd/installer in UEFI mode when installing. Alternatively you can try to convert your existing install, note this is quite tricky, make backups first! 1d) Your system may be using the classic VGA BIOS during boot despite running in UEFI mode. Often you can select BIOS mode compatility in your BIOS settings aka the CSM setting. If you can select this on a per component level, set the VIDEO/VGA option to "UEFI only" or "UEFI first", alternatively you can try completely disabling the CSM mode. 2) I get a grey-background instead of the firmware splash while Fedora is booting? Do "ls /sys/firmware/acpi/bgrt" if you get a "No such file or directory" error then try answers 1c and 1d . If you do have a /sys/firmware/acpi/bgrt directory, but you are still getting the Fedora logo + spinner on a grey background instead of on top of the firmware-splash, please file a bug about this and drop me a mail with a link to the bug. 3) Getting rid of the vendor-logo/firmware-splash being shown while Fedora is booting? 4) Keeping the firmware-splash as background while unlocking the disk? Note if you do this the disk-passphrase entry dialog may be partially drawn over the vendor-logo part of the firmware-splash, if this happens then try increasing DialogVerticalAlignment to e.g. 0.7 . 5) Get detailed boot progress instead of the boot-splash ? To get detailed boot progress info press ESC during boot. 6) Always get detailed boot progress instead of the boot-splash ? For those of you who want to give the new Flicker Free Boot enhancements for Fedora 30 a try on Fedora 29, this is possible now since the latest F29 bugfix update for plymouth also includes the new theme used in Fedora 30. Run "sudo grub2-mkconfig -o /etc/grub2-efi.cfg"
Note that i915.fastboot=1 causes the backlight to not work on Haswell CPUs (e.g. i5-42xx CPUs), this is fixed in the 5.0 kernels which are currently available in rawhide/F30. Now on the next boot / installing of offline-updates you should get the new theme. Fedora 30 now contains all changes changes for a fully Flicker Free Boot. Last week a new version of plymouth landed which implements the new theme for this and also includes a much improved offline-updates experience, following this design. ATM the texts in the offline-updates theme are not translated. They are rendered using pango + cairo, so we have the capability to make this fully translatable into all languages, I just need to add gettext support to plymouth for this. I plan to do this next week. This all assumes that you are booting your machine with UEFI and your firmware supports the BGRT extension (which almost all firmware does). Otherwise you will get a dark-grey background instead of the firmware boot-splash. i've just landed a big milestone for the Flicker Free Boot work I'm doing for Fedors 30. Starting with todays rawhide kernel build, version 5.0.0-0.rc4.git3.1, the fastboot option for the i915 Intel display driver is enabled by default on systems with a Skylake CPU/iGPU and newer, as well as on Valleyview and Cherryview (Bay- and Cherry-Trail) systems. This means that the last modeset / flicker during boot of UEFI systems using the integrated Intel GPU for display output is now gone. As discussed in my previous blog post one of my TODO list items for plymouth is creating a new plymouth theme. Since the transition to plymouth is not entirely smooth plymouth by default will wait 5 seconds (counted from starting the kernel) before showing itself so that on systems which boot under 5 seconds it never shows. As can be seen in this video, this leads to a very non-smooth experience when the boot takes say 7 seconds as plymouth then only shows briefly, leading to a kinda "flash" effect while it briefly shows. Another problem with the 5 second wait, is now that we do not show GRUB the user is looking at the firmware's bootsplash for not only the often long firmware initialization time, but also for the 5 seconds plymouth waits on top, making it look as if nothing is happening. To fix this I've been working on a new plymouth theme which draws a spinner over the firmware boot splash, eliminating the ugly transition from the firmware boot splash to plymouth. This also allows removing the show-delay, so that we provide feedback that something is happening as soon as plymouth starts. Note the videos with diskcrypt where paused when I entered my passphrase. So there is a bit of a jump in them because of this. This regenerates the initrd for the kernel you are currently running, so if you've installed a kernel update and have not rebooted since then you may not get the new theme when rebooting. In this case rerun the dracut command after rebooting. Note if you've previously followed my instructions to test flickerfree boot, then you need to remove "plymouth.splash_delay=20" from your kernel commandline, since we now no longer want to have a splash-delay. Now reboot and you should get the new spinner on firmware-boot-splash theme, with Fedora branding. If you give this a try and the new theme somehow does not look correct, please mail at hdegoede@redhat.com. If you mail me about the theme not displaying correctly please attach the /run/plymouth.log file which this test-build generates to the email and a video of how the theme misbehaves would be great too. I still need to discuss the idea of using a new theme incorporating the firmware boot splash with the GNOME design team so this is all subject to change. 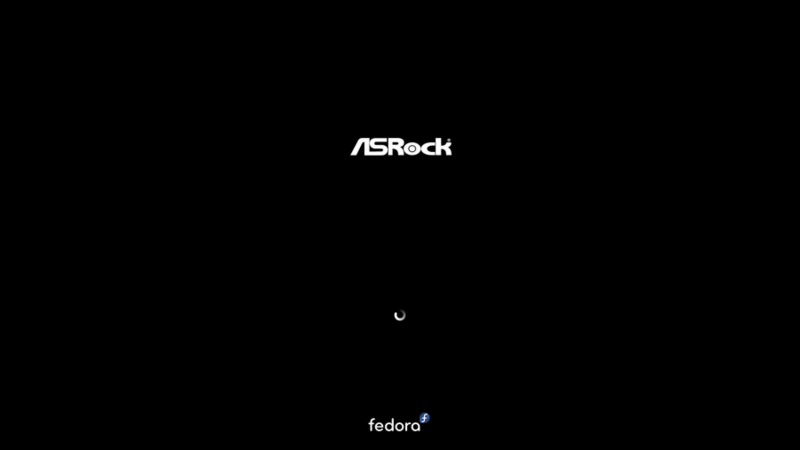 A big project I've been working on recently for Fedora Workstation is what we call flickerfree boot. The idea here is that the firmware lights up the display in its native mode and no further modesets are done after that. Likewise there are also no unnecessary jarring graphical transitions. Basically the machine boots up in UEFI mode, shows its vendor logo and then the screen keeps showing the vendor logo all the way to a smooth fade into the gdm screen. Here is a video of my main workstation booting this way. There have been changes to the kernel to properly inherit the EFI framebuffer when using Intel integrated graphics, and to delay switching the display to the framebuffer-console until the first kernel message is printed. Together with changes to make "quiet" really quiet (except for oopses/panics) this means that the kernel now also leaves the EFI framebuffer with the logo intact if quiet is used. There have been changes to plymouth to allow pressing ESC as soon as plymouth loads to get detailed boot messages. Add "i915.fastboot=1" to the kernel commandline, this removes the first and last modeset during the boot when using the i915 driver. Add "plymouth.splash-delay=20" to the kernel commandline. Normally plymouth waits 5 seconds before showing the charging Fedora logo so that on systems which boot in less then 5 seconds the system simply immediately transitions to gdm. On systems which take slightly longer to boot this makes the charging Fedora logo show up, which IMHO makes the boot less fluid. This option increases the time plymouth waits with showing the splash to 20 seconds. So if you have a machine with Intel integrated graphics and booting in UEFI mode, you can give flickerfree boot support a spin with Fedora 29 by just adding these 2 commandline options. Note this requires the new grub hidden menu feature to be enabled, see the FAQ on this. Work with the upstream i915 driver devs to make i915.fastboot the default. If you try i915.fastboot=1 and it causes problems for you please let me know. Write a new plymouth theme based on the spinner theme which used the vendor logo as background and draws the spinner beneath it. Since this keeps the logo and black background as is and just draws the spinner on top this avoids the current visually jarring transition from logo screen to plymouth, allowing us to set plymouth.splash-delay to 0. This also has the advantage that the spinner will provide visual feedback that something is actually happening as soon as plymouth loads. Look into making this work with AMD and NVIDIA graphics. Please give the new flickerfree support a spin and let me know if you have any issues with it. 1. What is the GRUB hidden menu change? See the Detailed Description on the change page. The main motivation for adding this is to get to a fully flickerfree boot. 2. How to enable hidden GRUB menu? Note the grub2-mkconfig will overwrite any manual changes you've made to your grub.cfg (normally no manually changes are done to this file). If you can get to gdm, access the top-right menu (the system menu) and click on the power [⏻] icon. Then keep ALT pressed to change the "Restart" option into "Boot Options" and click "Boot Options". While booting keep SHIFT pressed, usually you need to first press SHIFT when the vendor logo is shown by the firmware / when the firmware says e.g. "Press F2 to enter setup" if you press it earlier it may not be seen. Note this may not work on some machines. During boot press ESC or F8 while GRUB loads (simply press the key repeatedly directly after power on until you are in the menu). Press CTRL + ALT + F6 to switch away from gdm, followed by CTRL + ALT + DEL. Press the power-button for 4 seconds to force the machine off. the menu will show the next boot. Manually set the menu show once flag by running: "grub-set-bootflag menu_show_once" This will cause the menu to show for 60 seconds before continuing with the default boot-option. 5. When is a boot considered successful ? The boot_success grub_env flag gets set when you login as a normal user and your session lasts at least 2 minutes; or when you shutdown or restart the system from the GNOME system (top-right) menu. So if you e.g. login, do something and then within 30 seconds type reboot in a terminal (instead of doing the reboot from the menu) then this will not count as a successful boot and the menu will show the next boot. First of Thank you to everyone who has been sending me PSR test results, I've received well over a 100 reports! The Intel graphics team has been working on a number of fixes which make PSR work better in various cases. Note we don't expect this to fix it everywhere, but it should get better and work on more devices in the near future. PSR code is ready for people to (re-)test (sorry). Update: Thank you everyone for all the test-reports I've received. The response has been quite overwhelming, with over 50 test-reports received sofar. The results are all over the place, some people see no changes, some people report the aprox. 0.5W saving my own test show and many people also report display problems, sometimes combined with a significant increase in power-consumption. I need to take a closer look at all the results, but right now I believe that the best way forward with this is (unfortunately) a whitelist matching on a combination of panel-id (from edid) and dmi data, so that we can at least enable this on popular models (any model with atleast one user willing to contribute). As you've probably read already I'm working on improving Linux laptop battery live, previously I've talked about enabling SATA link powermanagement by default. This is now enabled in rawhide / Fedora 28 since January 1st and so far no issues have been reported. This is really good news as this leads to significantly better idle power consumption (1 - 1.5W lower) on laptops with sata disks. Fedora 28 will also enable HDA codec autosuspend and autosuspend for USB Bluetooth controllers, for another (aprox) 0.8W gain. But we're not done yet, testing on a Lenovo T440s and X240 has shown that enabling Panel Self Refresh (PSR) by setting i915.enable_psr=1 saves another 0.5W. Enabling this on all machines has been tried in the past and it causes problems on some machines. So we will likely need either a blacklist or whitelist for this. I'm leaning towards a whitelist to avoid regressions, but if there are say only 10-20 models which don't work with it a blacklist makes more sense. So the most important thing to do right now is gather more data, hence this blog post. Check if your laptop uses an eDP panel, do: "ls /sys/class/drm" there should be a card?-eDP-1 there, if not your laptop is using LVDS or DSI for the panel, and this does not apply to your laptop. Check that your machine supports PSR, do: "cat /sys/kernel/debug/dri/0/i915_edp_psr_status", if this says: "PSR not supported", then this does not apply to your laptop. Get a baseline powerconsumption measurement, install powertop ("sudo dnf install powertop" on Fedora), then close all your apps except for 1 terminal, maximimze that terminal and run "sudo powertop". Unplug your laptop if plugged in and wait 5 minutes, on some laptops the power measurement is a moving average so this is necessary to get a reliable reading. Now look at the power consumption shown (e.g. 7.95W), watch it for a couple of refreshes as it sometimes spikes when something wakes up to do some work, write down the lowest value you see, this is our base value for your laptops power consumption, write this down. Note beware of "dim screen when idle" messing with your brightness, either make sure you do no touch the laptop for a couple of minutes before taking the reading, or turn this feature of in your power-settings. Add "i915.enable_psr=1" to your kernel cmdline and reboot, check that the LCD panel still works, try suspend/resume and blanking the screen (by e.g. locking it under GNOME3) still work. Check that psr actually is enabled now (you're panel might not support it), do: "cat /sys/kernel/debug/dri/0/i915_edp_psr_status" and check that it says both: "Enabled: yes" and "Active: yes"
Dump your LCD panels edid, run "cat /sys/class/drm/card0-eDP-1/edid > panel-edid"
Once I've info from enough models hopefully I can come up with some way for us to enable PSR be default, or at least build a whitelist with popular laptop models and enable it there.